Extremely rare dark green patinated bronze and ivory oval hand mirror, France Circa 1925. This mirror is a museum piece, the exact same one is included in the New York Metropolitan Museum collection under the Accession number 25170. 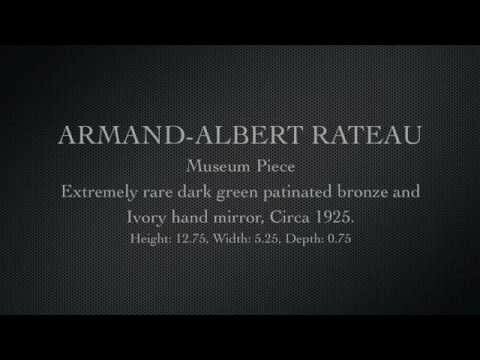 Only two copies of this mirror are recorded in the art market: one belonging to the Metropolitan Museum in New York and this second one, which was part of the famous George and Florence Blumenthal collection. These two American collectors were the very first major commissioners of Armand-Albert Rateau, who furnished their residences. The piece is stamped “AA RATEAU/INV"
Condition: Excellent original condition. Minor wear consistent with age and use.